The focus of today's class was Trentino in northern Italy and Fernando told us that the cuisine was heavily influenced by Austria. This made a lot of sense to me, as almost everything we cooked was a version of something I grew up eating at my grandmother's house, who grew up in Poland. The dishes were hearty and filling, the “stick to your ribs” kind of food that would keep you warm in the winter. 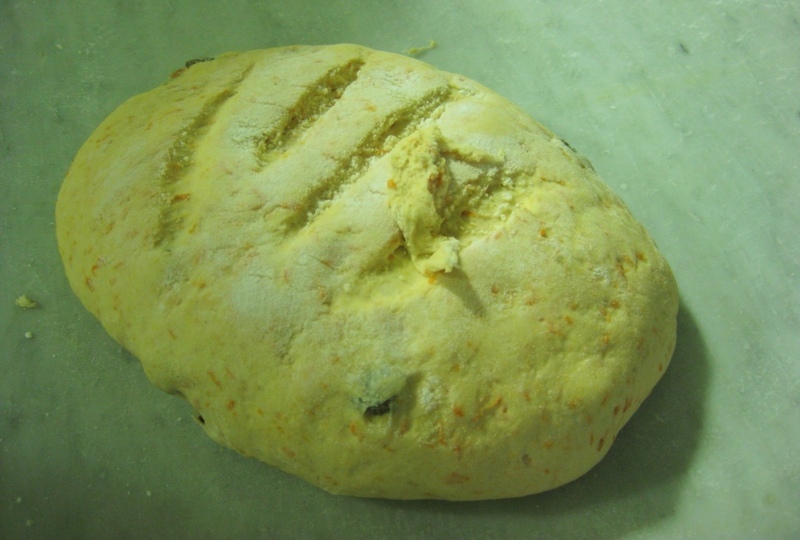 We started with an antipasto of pane di zucca or bread infused with pumpkin and raisins. After roasting and draining the pumpkin we made dough by mixing flour, milk, yeast, water, and salt with the pumpkin and raisins and let the dough rise before cutting it into rolls. The primo piatto was canederli in brodo or bread-based gnocchi in a light broth. The preparation and consistency of this dish reminded me a lot of matzo balls, except the Italian version had pork (of course). 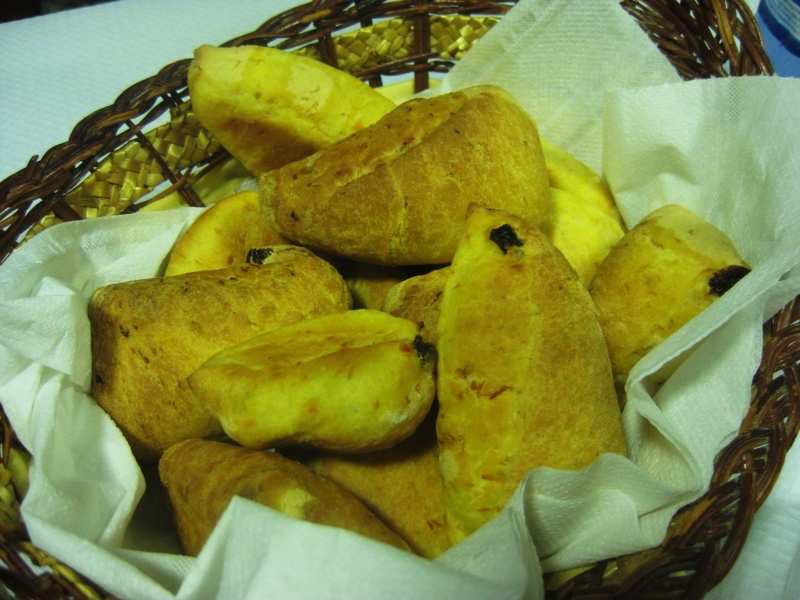 We took a day-old loaf of bread and crumbled it into pieces that we soaked in milk and egg. In parallel, we minced red onions and speck and sautéed them while also boiling a vegetable broth of potatoes, celery, carrots, onions, and tomatoes. 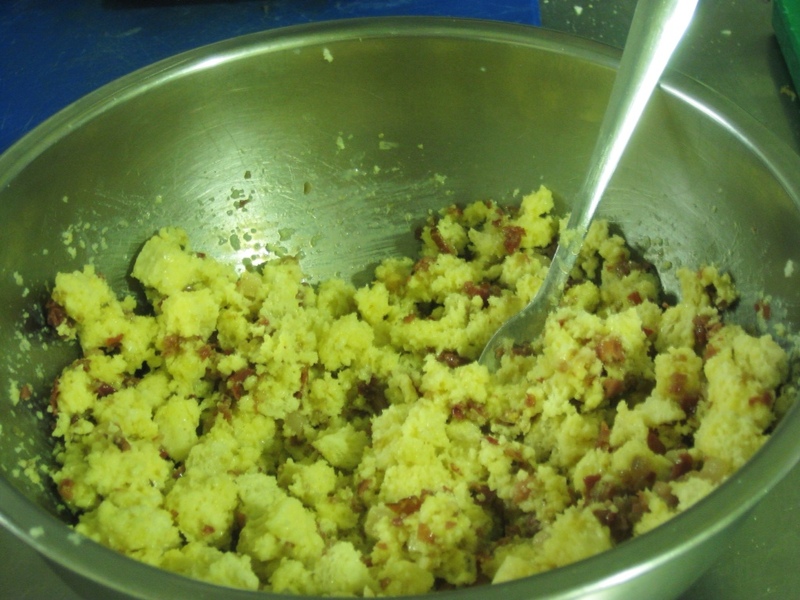 Once the meat had cooled, we combined it with the bread mixture, added some grated parmesan cheese for good measure, and made balls of dough that we dropped into the softly boiling broth. 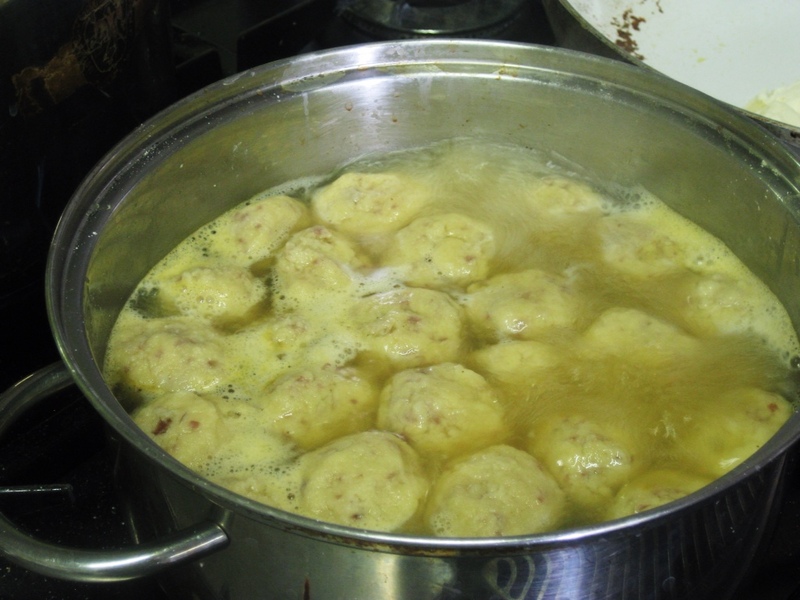 Once the balls rose to the top, we let them cook for another 5-10 minutes (in contrast to potato gnocchi, which are finished as soon as they rise to the top) and then put them in a saucepan of melted butter and sage, slowly adding broth as the sauce thickened. 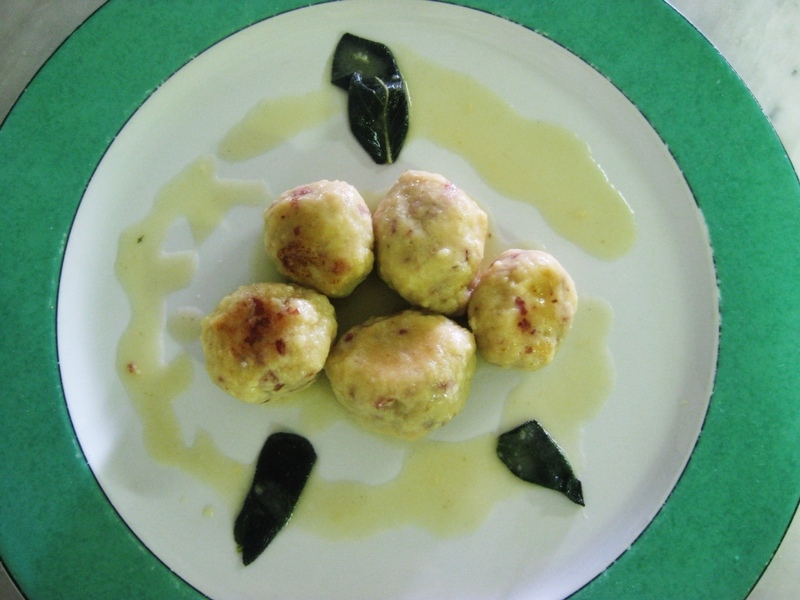 The balls were dense and heavy and while they may not be the most attractive dish, they are satisfyingly filling and have a subtle flavor from the onions and speck. Our secondo was gulash alla ungherese, a Hungarian influenced braised beef stew simmered in a sauce of tomatoes, garlic, beer, broth, marjoram and paprika. This is another dish I recognized from childhood and while what we made was delicious, it didn't quite measure up to my memory (which I will admit is not a particularly fair standard). 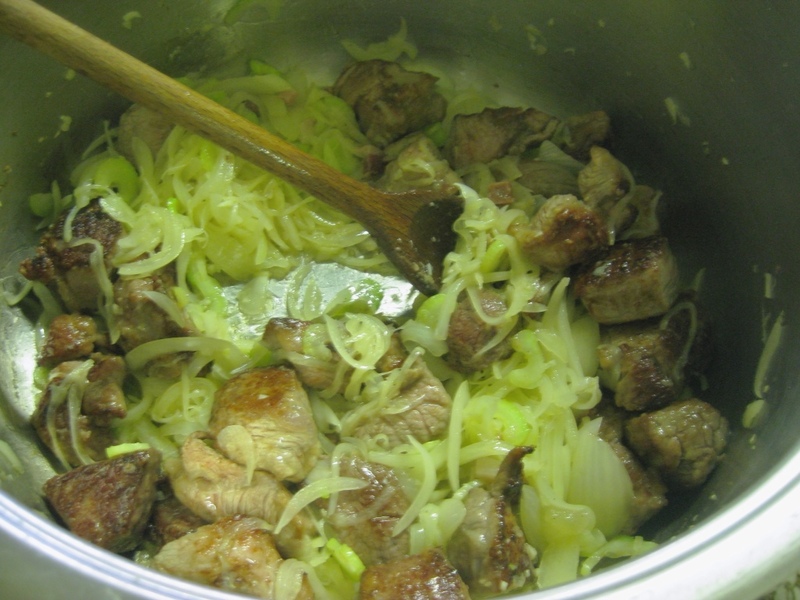 First we dusted the beef cubes in flour and sautéed them until they were brown, at which point we added them to a simmering pot of onions, celery, garlic, and pancetta, and poured a can of beer and tomato concentrate over the mixture. We let the dish simmer for the next hour or so, periodically stirring and adding more broth if needed. 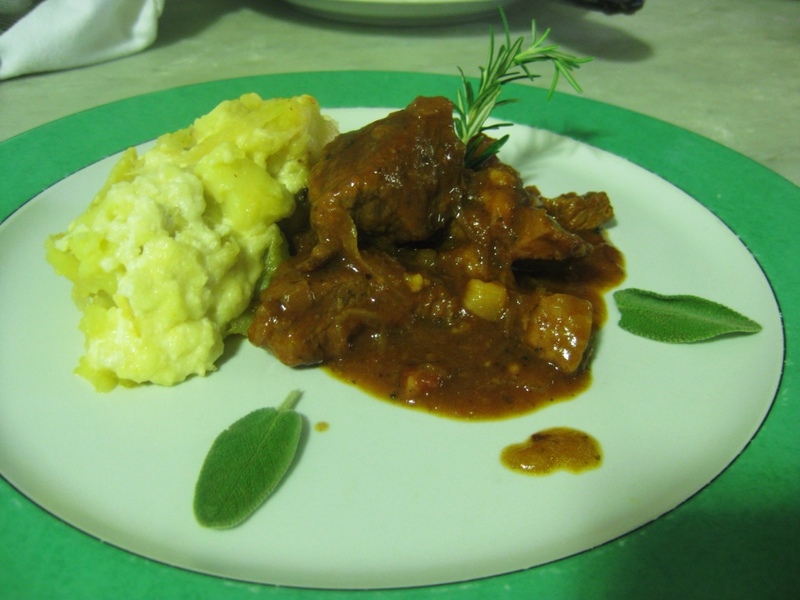 Accompanying the gulash was a contorno of patate alla trentina, a potato and onion dish topped with a creamy sauce. 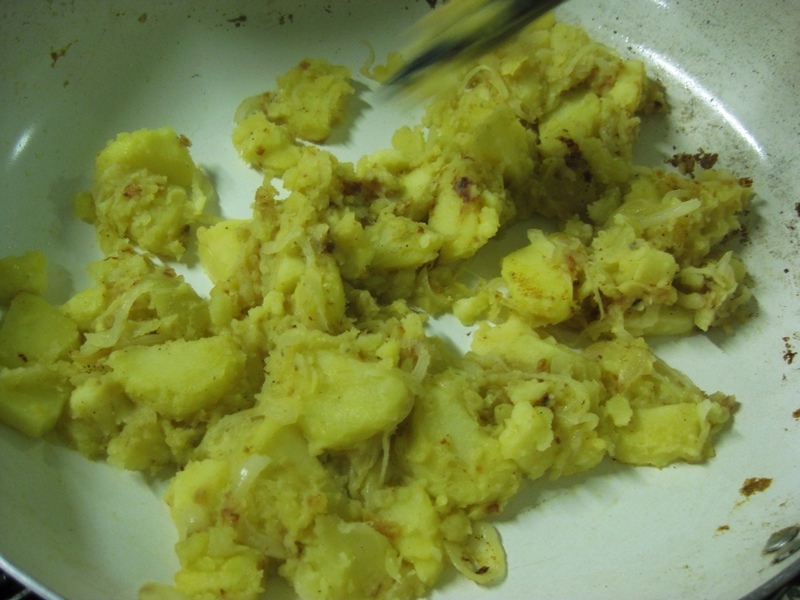 First we boiled and peeled the potatoes and then sautéed them with onions and a touch of nutmeg. In parallel we simmered a pot of cheese and cream and then combined the two just before serving. 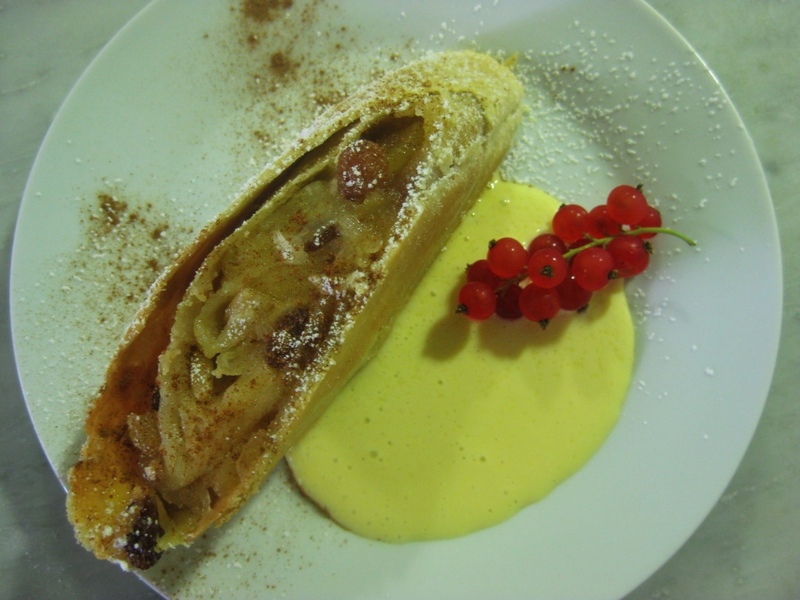 Lastly was the very impressive dolce – strudel di mele e cannella or apple strudel. Ferdinando told us with pride that the dough we made was the authentic Austrian dough, which he learned how to make when he worked in a kitchen there. After making the dough of flour, sunflower seed oil, egg, salt, and water we let it rest in the fridge for a half hour before rolling it out into a very thin, very large square. 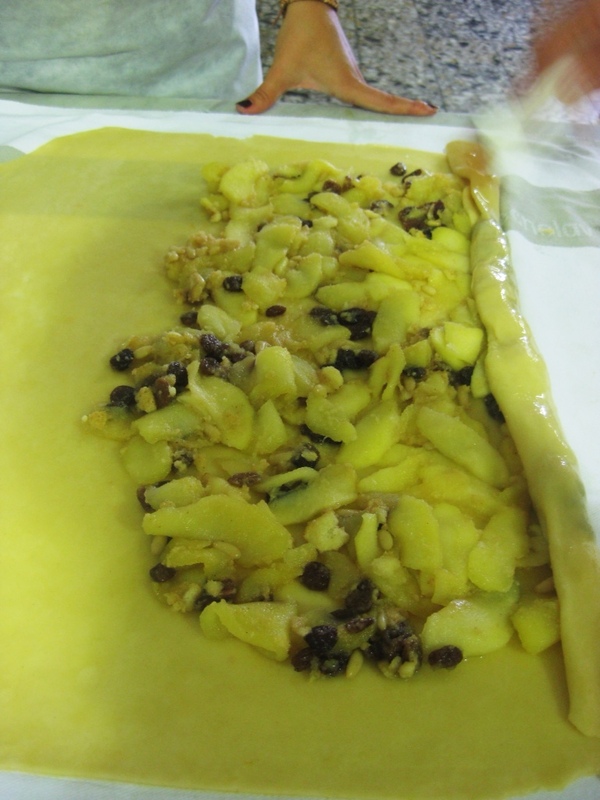 We layered on a mixture of apples, sugar, raisins, pine nuts and some biscotti that we had sautéed in butter and then proceeded to roll up the strudel, painting oil on the dough with every roll. 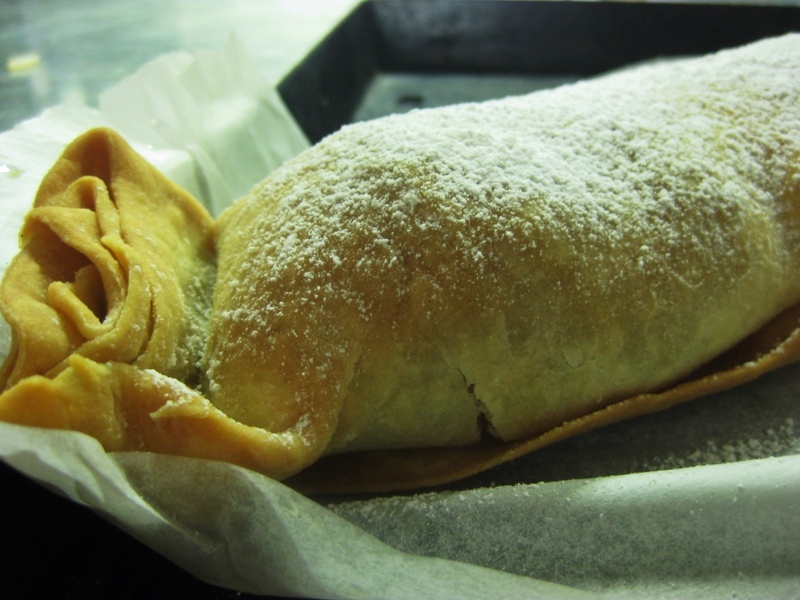 Once the strudel was in the oven, we watched it carefully, painting on oil every ten minutes for the half hour it baked. Just before serving the strudel with powdered sugar and cinnamon we also whipped up a quick vanilla custard – because strudel alone certainly wouldn't have been enough! We made the custard by whisking together egg yolk, sugar, milk, and vanilla over a low heat until it thickened. Served with the strudel it was an amazing dessert, and I'm not usually a baked apple kind of girl. I can't believe this is already the end of the first week of cooking! I've learned so much, particularly about how much more I have to learn. Luckily, I plan to eat my way through Bologna this weekend to help me prepare for another week of cooking. This entry was posted in Classes, Italian, Italy, Siena, Uncategorized and tagged Italian. Bookmark the permalink.